To see all the features of the Mamu Tropical Skywalk requires a 2.5 km return walk and takes at least one hour. An hour and a half is recommended to allow for rest stops in the shelters and time to enjoy the scenery. If you have limited time or are unable to walk the entire distance, you may choose to do only part of the walk. 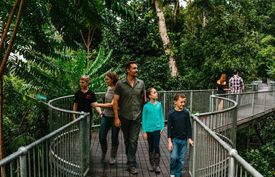 The Forest walk serves as the access track to the cantilever, elevated skywalk and observation tower and provides the opportunity to experience tropical rainforest at ground-level. Alternative routes suitable for wheelchairs and strollers are provided along the Forest walk (indicated by directional signs). This track is suitable for visitors with vision-impairment with tap rails forming a continuous 'shoreline' on the left hand side of the track. Seats are provided along the way. 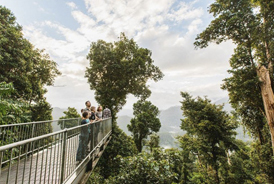 To the left, just past the first rest shelter, a 40 m long elevated walkway rises gently as the ground below drops away steeply, providing visitors with their first chance to experience the rainforest canopy. The viewing platform at the end of the 10 m long cantilever offers magnificent views of the river gorge below. Return the way you came to rejoin the Forest walk which continues on to the elevated walkway. 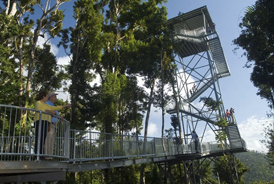 From the second rest shelter, the Skywalk meanders for 350 m through the rainforest canopy. Along the way visitors can view rainforest plants and animals at close quarters and gain tantalising glimpses of the river valley far below. Two small shelters positioned at regular intervals along the Skywalk provide shade. From these shelters there is the option to leave the skywalk and return to the ground-level Forest Walk. A third ground-level rest shelter is located at the base of the Skywalk leaving from the second canopy-level shelter. Access to the Observation Tower is from the fourth ground-level rest shelter at the end of the Forest Walk (past the Skywalk). From here a short elevated walkway leads to the tower's lower viewing deck. The top of the Tower is reached by stairway (not wheelchair accessible) and at 37 m above ground-level offers spectacular, uninterrupted vistas of World Heritage landscapes. Picnic tables are provided near the entrance. Nearby Gooligans and Henrietta Creek day-use areas have picnic facilities and are accessed from the Palmerston Highway. 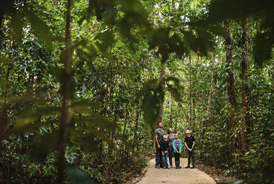 The Forest walk comprises of more than 1 km of hardened walking tracks allowing exploration of the rainforest at ground level. The cantilever suspends visitors over the rainforest as it slopes into the river gorge. The skywalk allows visitors to explore the rainforest canopy. For many visitors, the observation tower is the highlight of their Mamu Tropical Skywalk experience.